LAWRENCE, Kan. – The Bears completed a doubleheader sweep of host Kansas on Saturday at Haglund Ballpark. The Bears won game one in come-from-behind fashion, 8-2, and game two in an 8-0 shutout. The red-hot Nick Loftin led the way at the plate, with two multi-hit performances, going 5-for-10 with 4 RBI and one home run. In game one, the Bears got outstanding pitching from starter Paul Dickens, who threw a career-high 6.0 innings, allowing just two runs on two hits while striking out a career-best 12 batters and walking just two. He combined with Daniel Caruso, who threw a scoreless seventh inning and Ryan Leckich, who put up zeros in the eighth and ninth as the pitching staff held the Jayhawks (14-12, 0-5 Big 12) to just two runs on three hits. The Baylor offense jumped out to a 1-0 lead in the fifth inning off a sac fly by Andy Thomas. However, the Jayhawks answered right back, with a two-run homer by Blaine Ray to take a 2-1 lead in the bottom half of the inning. In the seventh inning, the Bears were able to break open the game in a big way. Cole Haring mashed an opposite field grand slam, his team-leading sixth homer of the year to give the Bears the lead back, 5-2. Then with two outs, Richard Cunningham delivered his first of two homers on the day, this one a three-run shot to give the Bears an 8-2 lead. That was all the Bears needed, as the bullpen of Caruso and Leckich shut things down the rest of the way. Dickens, who carried a no-hitter into the fifth inning and at one point retired 10 straight, earned the win to advance to 3-1 on the year, while Jayhawks’ reliever, Blake Goldsberry took the loss to fall to 2-3 on the year. In game two, the Bears wasted no time getting on the board, as Davis Wendzel cranked a solo shot with two outs in the top of the first inning to jump on starter Ryan Cyr, 1-0. From there the Bears plated at least run in every other inning. In the top of the third the Bears added a second on a Nick Loftin single, his first of four RBI on the day. Then in the fifth inning, Cunningham connected on his second homer of the day and fourth of the year, a solo shot to make it a 3-0 ballgame. In the seventh, it was Loftin’s time for his fourth homer of the year, this one a two-run shot as the Bears’ lead ballooned to 5-0. Then in the ninth, the Bears were able to take advantage of some miscues by the Jayhawks, as they lost multiple balls in the lights as they dropped in for hits. The Bears plated three runs on four hits, receiving RBIs from Loftin, Cunningham and Andy Thomas. Starter Jimmy Winston was outstanding, earning his third win of the year, tossing a career-best 7.0 scoreless innings, while striking out a career-high five and walking just two. Jacob Ashkinos finished off the shutout for the Bears, putting up zeros in the eighth and ninth to complete the sweep. *Baylor has won seven games in a row and 11 of its last 13. This is the second time this season the Bears have recorded a win streak of at least seven games; the Bears opened the season with eight consecutive victories. *The Bears have scored 60 runs during their five-game win streak. *The Bears have won five-of-six weekend series, including two-straight conference series. *The game-two shutout was Baylor's fifth of the season. 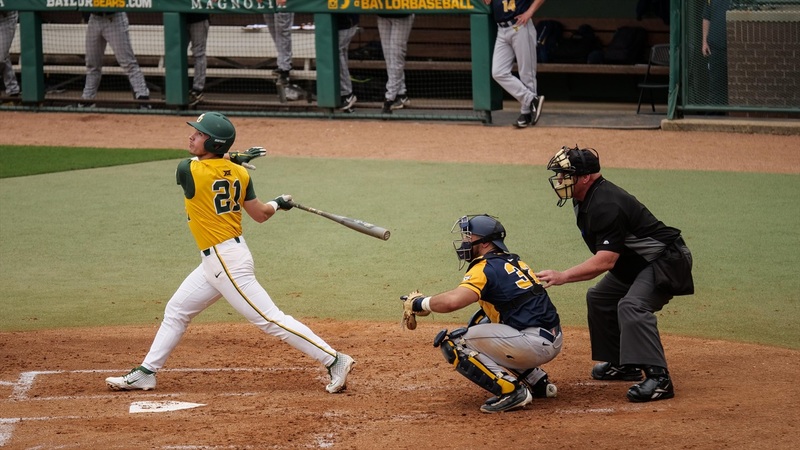 *The come-from-behind victory in Baylor’s 8-2 victory in game one was the 12th come-from-behind victory this season and fourth in as many games. *Since inserting Nick Loftin in the leadoff spot on March 10, the Bears have scored 99 runs on 151 hits in their last 13 games. Loftin is 23-for-53 with 4 HR, 14 RBI and 17 runs scored during the stretch. The Bears are 11-2 in such games. *The game one victory was the Bears’ 12th come-from-behind victory of the year. *102 of the Bears’ 198 runs scored on the year have come with two outs. In game one, Cunningham’s three-run home run in the seventh inning was with two outs. Then in game two, 7 of the Bears’ eight runs came with two outs. *Cole Haring launched his sixth home run of the year, this one a grand slam in the first game. *Richard Cunningham hit a home run in each game of the doubleheader. In game one he launched a three-run shot and in game two a solo home run, his fourth of the year. *Nick Loftin launched his fourth homer of the year, part of his 4-RBI performance in game two. *Davis Wendzel launched a solo shot in the first inning of game two, his fourth of the year. *Loftin has a team-leading 13-game on-base streak and ninw-game hit streak. He picked up his team-leading 17th and 18th multi-hit games of the year. *Loftin has tallied seven straight multi-hit performances. He is 16-for-28 over those contests. *Andy Thomas extended his on-base streak to 13 games. *Haring extended his eight-game on-base streak with his eighth multi-hit game of 2019 in game one of the double header. The streak was snapped in game two. *Langeliers extended his on-base streak to eight games in game one, but saw it snap in game two of the double header. *Josh Bissonette extended his on-base streak to eight games with two walks in game one of the double header, but saw it snapped as he did not reach in game two. *Davis Wendzel extended his on-base streak to seven games. *Wendzel has had 12 multi-hit games on the day after going 2-for-3 in game one of the double header. 8 – The Bears offense collected 8 runs in each of the wins in the doubleheader. The Bears will go for the series sweep over Kansas on Sunday, March 31 at 1:00 p.m. CT at Hoglund Ballpark in Lawrence. Winston is just unconscious! B2B MVP's for BU?! Hill shuts any door w great command. ERA? Zilch. Young gun, Blake Helton, is gonna be special. Wendzel toying w .400. League leader. Loftin has taken his game a big step up. Haring's bat can change games. 26 RBI's. Surprising power. ...and the list goes on. These guys are stepping up.